Against a backdrop of mutual challenges in the Albemarle-Pamlico estuary from climate change and budget shortfalls, an updated partnership between Virginia and North Carolina is starting to flex its collaborative muscle with important border-blind issues: wetlands, algal blooms and fish travel. The memorandum of understanding, or MOU, that was signed Nov. 1 by representatives of environmental agencies in both states will make it easier for sharing of information and resources in management of the second largest estuary in the continental United States. 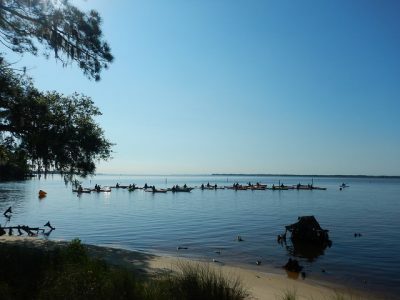 The program, founded in 1987, encompasses the Neuse, Tar-Pamlico, Pasquotank, Chowan, lower Roanoke and portions of the White Oak river basins, a total of 3,000 square miles of open water. 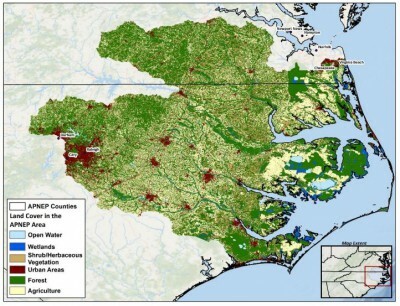 Water from 43 counties in North Carolina and 38 counties and cities in Virginia drain into the 31,500 square miles of total watershed area. Crowell said that previous attempts to update a similar MOU from 2001 were thwarted by the states’ changing politics and agencies. But in light of new administrations in Virginia and North Carolina, he said, it was decided last spring to give an update another shot. A significant difference in the current MOU is that it is more focused, and it requires staff to follow-up on progress with an annual review, said Kirk Havens, chair of the partnership’s leadership council. “You look at them from the North Carolina side, and the Virginia side but we want to look at them from a watershed component combining GIS in a complement that’s shared,” Havens said. Havens said he expects the new maps will be ready to be utilized by APNEP’s Wetlands Resource Monitoring and Assessment Team in a few months. Considering that air and water, not to mention animals and plants, pay no attention to boundary lines, the partnership sees a lot to be gained overall in having a more holistic management option in the vast estuary. 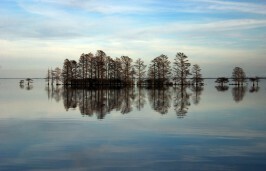 For instance, in the Chowan River basin alone, it has been plagued in recent years by invasive hydrilla, an aquatic weed; blue catfish, a voracious non-native fish; and algal bloom, potentially toxic overgrowth of algae – all that threaten waters in both states. The bi-state approach fostered by the new agreement is not reinventing the wheel, but instead is incorporating existing data sets and planning strategies, Crowell said. Now they can be more readily shared and coordinated. A lot of the communication will be done electronically, although there will also be meetings held in different locations throughout Virginia and North Carolina. 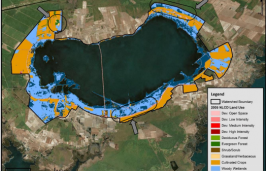 It won’t equal the star power of the Chesapeake Bay multi-state consortium, but it may help the Albemarle-Pamlico to gain more of the attention from the Chesapeake – the largest estuary. Funding is not provided in the MOU, Crowell said, but the agreement can make is easier for states to co-apply for grants and share costs of a project. Increasing impacts from sea level rise and climate change have exacerbated the ongoing stresses to the ecosystems. Still, saltwater intrusion, flooding, erosion and loss of habitat, among other related issues, have been on environmental management radar screens in the region for many years. “That just adds to the problem rather than being a separate problem,” Crowell said of climate change. Efforts have already been coordinated between state environmental agencies to coordinate data sharing in the Chowan and Pasquotank river basins. 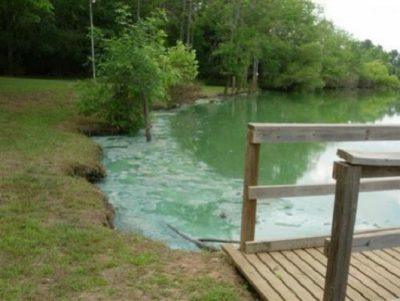 On the North Carolina side of the Chowan basin, algal blooms that have persisted for several years are still not understood, and the partnership is hopeful that agreement will help both states to work to identify the cause. Other projects the partnership plans to tackle in coming months include work to address fish passage and spawning habitat issues, nutrient pollution from drainage and invasive aquatic grasses and fish. The agreement is also expected to improve communication and coordination with the Roanoke Bi-State Commission. The agreement also expands the access to the U.S. Environmental Protection Agency, which is Region 4 in North Carolina and Region 3 in Virginia, and expands contacts with non-governmental groups in both states.